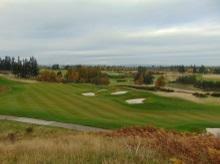 We were asked to complete ecological surveys of the world renowned Gleneagles Golf Course and estate grounds. The aim of this project was to produce a Phase 1 Habitat map to show the existing habitats and species present and produce a Habitat Management Plan with the aim of building on the habitats and species present to improve the overall biodiversity within the estate boundary. This was a great project to be involved in and we were very impressed with Gleneagles’ commitment to managing a wildlife friendly course and grounds and we hope to work with them again in the future to help implement some of our recommendations.